Selling your car in Darwin usually precedes a change in location, or a vehicle upgrade. If you’re sticking around the area with a new car, or you want to get some last adventures in before yours is sold, give a few of these local drives a whirl. If you’re a long-time local you’ve probably frequented this first stop, and if you haven’t then you definitely must go. 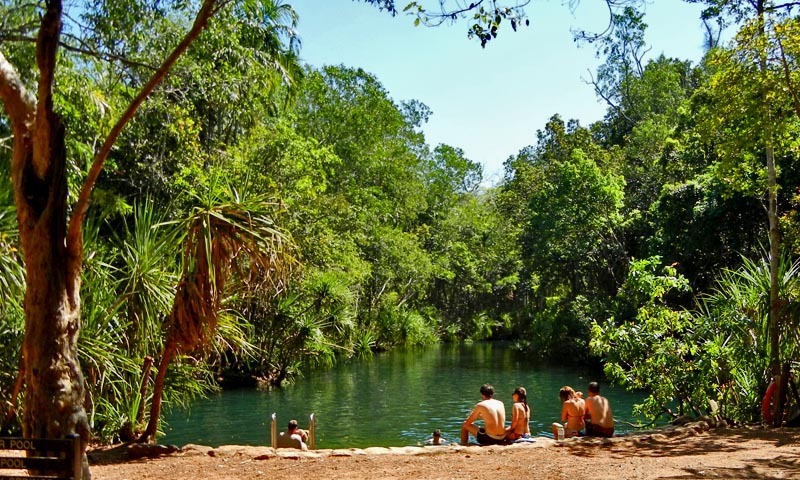 Roughly 50 kilometres south of Darwin lies the enchanting Berry Springs Nature Park, lush with swimming holes and bushwalking trails. You can take the National Highway 1, or start on Tiger Brennan Dr to Channel Island Road and Finn road, then finish on Cox Peninsula Road straight into the park. It’s not a far drive but pack a lunch and plan to spend a few hours, you’ll be happy you did. The pools are often closed during the wet season from October through to about March, but afterwards the native flowers rejoice by opening into full bloom. 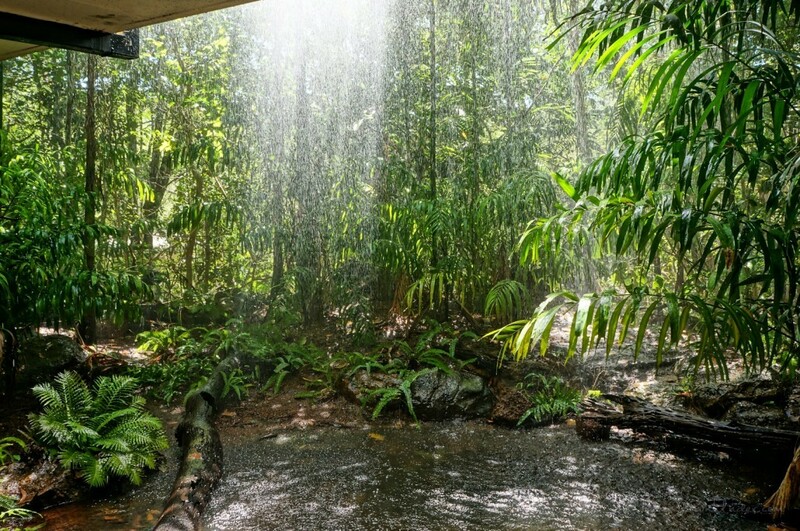 The area, along with the neighbouring Territory Wildlife Park, spans 820 hectares but the main attraction almost always the clean, clear, cool waters of the springs. Dappled light filtering through the Territory Wildlife park adjacent to Berry Springs, NT. With three pools in total you can begin at the smallest Berry Springs where there is a running waterfall you can bathe beneath. Berry Springs runs into what is called the Main Pool and then on into Lower Pool. You might notice a few warning signs about crocodiles, but the common crowds of locals seem to deem it quite safe. The water is so pure that you can see straight down to the rocks and pebbles that make up the floor, but the most darling phenomenon is the population of local fish! Many people bring snorkel gear to have a better look. If you’re not one for swimming, or you just need to stretch your legs, there is a lovely one-kilometre walking track that meanders through monsoon rainforest and woodlands which are full of birds and other wildlife. It is not entirely uncommon to come across water monitors, carpet pythons, or even the lovely white ibis birds which have become accustomed to humans in their habitat. Berry Springs Nature Park is a refreshing jewel in the Northern Territory’s hot and humid climate. As a Darwin-dweller, you’ll be sure to make this drive time and again. Crystal clear natural swimming pools at Berry Springs Nature Park, NT. If you’d like to take your drive a bit further but still keep it to a day trip, make the Berry Springs a quick stop then head to National Highway 1 and go South. Get off on Bachelor Road, connect to Rum Jungle Road, and finally make your way down State Route 30 to Litchfield National Park. From Darwin direct this takes about an hour and twenty minutes, roughly 115 kilometres. Litchfield National Park has all the wonders you’d hope for out in the wilderness, but it’s got a few extras that aren’t always guaranteed. As you’re driving in you’ll start to notice odd sand structures appearing that reach more than two metres high in some cases. These peculiar statues are, in fact, homes to termites, made out of dirt and a safe haven during times of flood when underground passageways are full of water. The other treasure of this area is Florence Falls, which is actually a double waterfall that comes crashing down when there is enough rain. The falls are set amidst the monsoon rainforest and you can swim in the waters beneath them. Shady Creek Walk is a 2K return from this area for those that don’t feel like swimming. This next point is only accessible to four-wheel-drivers, but it’s certainly worth a mention. Perhaps after you sell your car you can upgrade to a 4WD and expand your driving repertoire in the Darwin area. Anyhow, if you’ve got the means then definitely make the trip to Lost City. 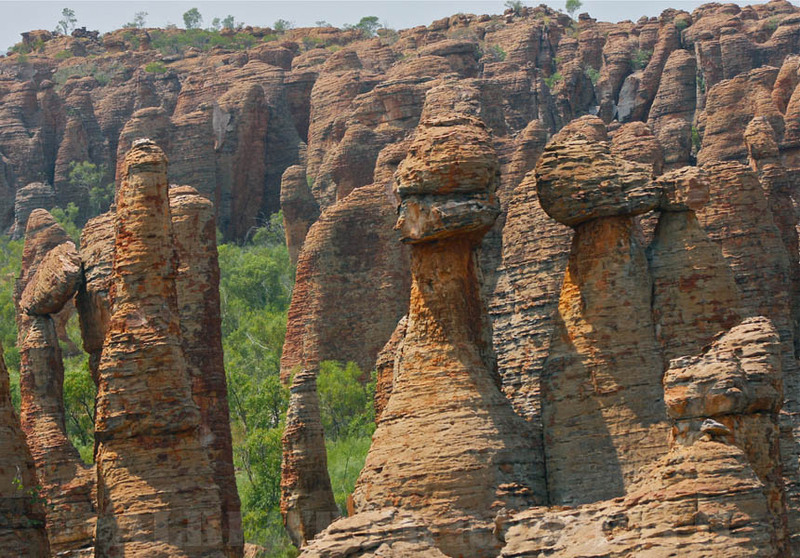 This is an unusual scene of sandstone rocks that have slowly weathered into tall, column-like formations in an arrangement much like an abode from a fairy tale of some sort. If you can’t get out to Lost City then another splendid option is the Buley Rockhole, which is actually a whole series of rockpools and waterfalls surrounded by bush and all are quite swimmable. The refreshing waters can dive up to two metres deep in some pools, but be carefull while clambering around the edges at they can get quite slippery. Make sure to check the Park’s website if you’re nearing the wet season as the pools are often closed to swimmers during those months. But no matter the time of year, Litchfield National Park always has something to offer. The strange and wonderful sandstone formations of Lost City, Litchfield National Park, WA. The next drive is a tad further from Darwin but still technically doable in one day, however it is much more fun to spend a night if you’re able. 150 Kilometres East and slightly South on the Arnhem Highway brings you to the dazzling Kakadu National Park off Kakadu Highway in Jabiru. This park is so large and contains so much magical landscapes that it is nearly impossible to absorb it all in one trip. However, don’t be put off because anywhere you choose to go will be rewarding and delightful. In these twenty thousand square metres of forests, sandstone, rivers and billabongs, there are over 2,000 plant species and myriad animals. The Ubirr and Nourlangie sites are popular areas for viewing indigenous rock paintings from 25,000 years ago. If you’re interested in saltwater crocodiles you can head to Yellow Water or Cahill’s Crossing. The former also has a colourful display of birdlife that will give you an eye-full and probably an ear-full as well. 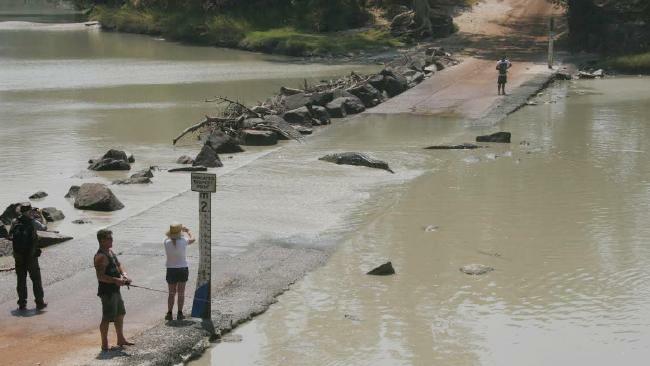 The park is an ever changing scene of one dramatic extreme to the next, from severe drought to flooding that brings saltwater crocodiles into odd territories. Due to the dangers that arise during the wet season, the dry season tends to be the most touristy and crowded period. That said, there is so much space for wandering and exploring that you will likely have no problem finding a quiet oasis amidst the bustle and awe. A common crocodile sighting at Cahill’s Crossing, Kakadu National Park, NT. The last drive on the menu today can be done in junction with Kakadu, as it’s Northern border is shared with Kakadu’s South. If you’d prefer to do this as a trip on it’s own, get onto National Highway 1 and go Southeast for roughly 250 kilometres until you can turn onto Edith Falls, and then finish on Gorge Road. It will take about 2 hours and 55 minutes total until you find yourself in Nitmiluk National Park, Nitmiluk meaning “cicada dreaming” in the local Indigenous Jawoyn language. This trip really does require at least one overnight in one of the three designated camping areas called Dulop Swamp, Smitt Rock, and Eigth Gorge. The charge is just over three dollars per night, per person; a steal considering the luxurious surrounding habitat you can reside in. The park is well known for it’s walking trails, and some of them can be tackled over multiple days. For a short one to two hour walk you can take the Baruwei Trail which is only 1.8K or 4.8 if you include the lookout point. From here you’ll have views of 17 Mile Valley and Katherine Gorge. If you want to incorporate swimming into your trek, head to Windolf or Butterfly Gorge on the Yambi Trail which will take 3.5-4.5 hours and lead you through butterfly rainforests, waterfalls, and deep-water gorge swimming. The whole park is a sparkling collection of gorges, rivers, and forests and the bird life is of the unusual kind. If you are lucky, you might even spot a red-tailed cockatoo, a red-winged parrot, or even a white-gaped honeyeater. The only caution is that during the wet season, the water levels rise enough that the saltwater crocodiles can enter into the rivers.. Prior to the dry season, however, the rangers relocate them and the waterways become swimmable again. Keep this in mind when planning your adventure, and make sure you are always prepared with enough water, petrol, and food when making your way out in the Northern Territory. The stunning Katherine Gorge within the Nitmiluk National Park, NT. These drives should keep you busy enough as you make your way out of Darwin to enjoy the beautiful life on the road, even if only for a day. If you ever make your way down the Western Coast, you might check out drives at https://www.areyouselling.com.au/sell-my-car/perth/ and see where they take you!